The Council on American-Islamic Relations (CAIR), the nation’s largest Muslim civil rights and advocacy organization, said today’s decision by the U.S. Supreme Court allowing a limited version of the Trump administration’s “Muslim ban” executive orders to take effect ignores the Islamophobic origins of the policy and emboldens Islamophobes in the Trump administration. “Today’s decision by the Supreme Court ignores the anti-Muslim bigotry that is at the heart of the travel ban executive orders and will inevitably embolden Islamophobes in the administration to expand efforts to target the Muslim community with unconstitutional and counterproductive policies. It also ignores the almost-unanimous rejection of the Muslim ban by lower courts due to its religious intolerance and racial animus. “While the court continued blocking those parts of the Muslim ban that would prevent entry for anyone with a ‘credible claim of a bona fide relationship with a person or entity in the United States,’ it has opened the door to legal chaos and official overreach in embassies and at the border. Awad said today’s decision was particularly disturbing for American Muslims, coming as it does on the Islamic end-of-Ramadan holiday of Eid ul-Fitr. CAIR will hold a noon news conference at its Capitol Hill headquarters on Tuesday to offer a broader reaction to the court’s decision. 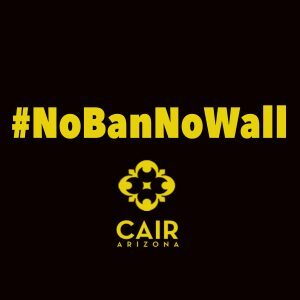 CAIR previously welcomed ruling by lower courts blocking both versions of the Muslim ban.